George Knight, 77, from Penarth has been awarded a medal by a leading health charity for living with Type 1 diabetes for over 50 years. George was diagnosed with Type 1 diabetes when he was 24 in 1964 after feeling unwell and dropping from 11 stone in weight to just 7 stone. After seeing his GP, George was sent immediately to Llandough hospital, where he stayed for a week before his condition stabilised. Since his initial diagnosis in such serious condition George has gone on to live a full and active life with Type 1 diabetes, managing his condition with daily insulin injections as well as a healthy diet and exercise. George is still passionate about helping others living with diabetes and is an active member of his local Vale of Glamorgan Diabetes UK group. This local network welcomes anyone affected by the condition and meets regularly at Llandough hospital to give each other advice and support on how to live well with diabetes. 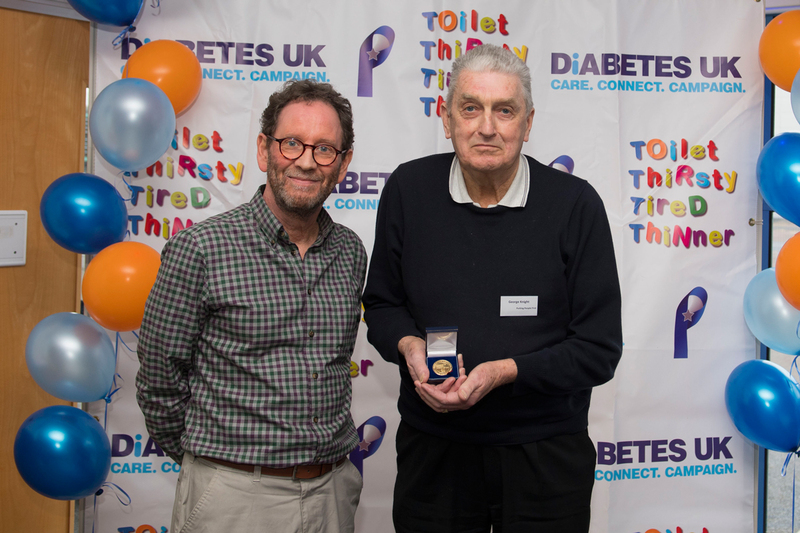 The Alan Nabarro medal was awarded to George by Diabetes UK Cymru at their annual volunteer conference in Nantgarw on Saturday 4 March, in recognition of his courage and perseverance in handling the condition. This medal is given to people who have lived with diabetes for 50 years. Alan Nabarro waged a lifelong battle against discrimination against people with diabetes. In 1968 he was awarded the OBE for his work with young people in London. George Knight said: “The amount of information and support available to people with diabetes is incredible these days, especially when you compare it with how little there was when I was first diagnosed in the 1960s. Things have improved so much since I was first diagnosed and I can’t wait to see future developments in diabetes treatment and care. Type 1 diabetes isn’t currently preventable and is an extremely serious condition that has nothing to do with being overweight. The symptoms can develop very quickly and include urinating frequently, weight loss, tiredness and increased thirst. Diabetes UK Cymru’s Director Dai Williams said: “George is an absolute inspiration, particularly for me as a parent of a child with Type 1 diabetes. He has really shown how to live a long and healthy life while managing his diabetes well. “Diabetes is both a serious and a complex condition, making it vital that people get the care and support they need that can help them to manage their condition effectively. Poorly managed, diabetes can lead to devastating but avoidable complications such as blindness, amputation and stroke. For information on getting involved with the Vale of Glamorgan group call Diabetes UK Cymru on 029 2066 8276 or email wales@diabetes.org.uk. To find out more about diabetes visit www.diabetes.org.uk.